We take a look at some luscious long hairstyles that are just perfect for your big day! For your night-time routine you’ll need two different types of cleansers. A heavy cream cleanser that is suitable for removing make-up (if you wear it) and dirt, and the same cleanser that you use during the morning. If you don’t already have a morning skin care routine then see our The best thing about having long hair to work with when it comes to choosing a bridal hairstyle is the versatility and choice you'll be able to get as long hair will allow you to style you hair up, down, half up, straight, curly or wavy! To see what we mean, and give you some great ideas, here are some of our favorite choices for a long wedding hairstyle. 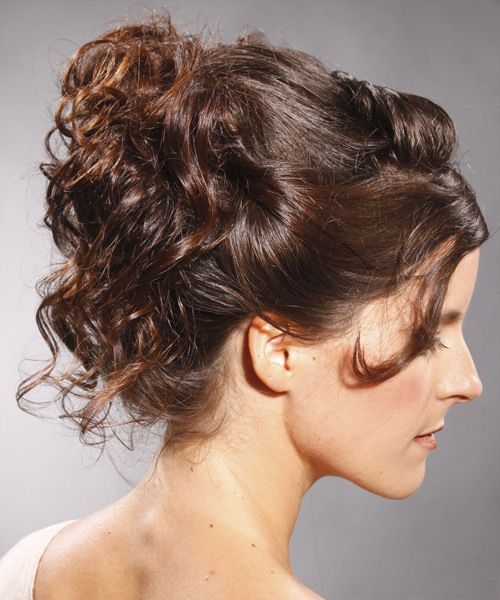 If you have really long hair then make the most of it with this elegant updo. Straight, shiny hair strands are a must to re-create this look, and the addition of full, blunt cut bangs will only add to the superb look of this sky-high style. To add a touch of class and glamorous interest to a long curly hairstyle, try pinning a section of your hair to the side with a hair accessory. For this type of look, the bigger the hair accessory, the better, but keep it to the theme of your wedding or as an accessory that will compliment your wedding dress. Long hair looks really great when styled straight, and to make straight lengths suitable for your wedding day, styling a section of your hair into a braided headband is a really great option. If you can't braid your own hair then a faux braided headband in the same hair color as your locks can work just as well. To add some romance and soft styling to your long bridal hairstyle you might want to consider curling your hair and then pulling it back into a pretty curly updo. By leaving some strands to fall around your face, you'll be creating a flattering hairstyle sure to impress on your big day. Our final bridal idea for long hair is to add some backcombing to your locks to create a volume-filled half up half down hairstyle that is then balanced out with some spiral curls through the lengths and ends. This will create a simple yet stunning look that can be accessorized to fit into any wedding theme. If you'd like to try any of these wedding hairstyles on your own photo, click on each image for a try on link. >Morning Skin Care Routine in 3 Easy Steps beauty blog for tips and advice. Make sure your hair is out of the way and massage your cream cleanser over your face using the massage techniques outlined in our Skin Care Tips: How to Give Yourself a Facial Massage beauty blog. Remove the cleanser with cotton wipes or a tissue (in gentle upward movements) and then repeat with your usual cleanser and rinse with some cool water and pat your face dry. A toner should be applied after cleansing to close your pores and stimulate circulation. Your toner should be selected based on your skin type or you can use simple water (in which case you can skip this step as rinsing off your cleanser has already toned your skin). Other toners can be applied directly to your skin with a cotton pad. For night moisturizing you’ll need a heavier moisturizer than what you’d apply during your morning routine. Apply a small amount of moisturizer while your skin is still damp from toning using the same massage techniques used for cleansing and then apply some eye cream to your eyes using light, gentle circles. Beauty Tip: Eye cream should be used from the age of 25 when the skin around your eyes starts to develop fine lines. Due to the heaviness of night creams you should remove any excess cream before going to bed with a tissue (try to make sure your cream has been left to work for at least 20 minutes). This will stop your eyes and skin from looking puffy when you wake up in the morning. Once you’ve applied your moisturizer then your night skin care routine is complete! By incorporating this routine into your beauty regime you’ll be well on your way to skin that looks refreshed and feels soft and supple. Unfortunately it does takes time for the good things we do to our skin to show through, while the bad stuff like too much junk food and a night on the town can appear right away. But the sooner you establish and incorporate a simple daily skin care routine, the better off your skin will be!